Stanley Basin is naturally poor elk winter range because it is the coldest inhabited town in Idaho and most of the grass is eaten by cattle in the summer, leaving very little for wintering elk. Stanley sits at the head of the Salmon River Canyon, and big game that migrates 5 or ten miles down into that canyon find an abundance of winter forage. Before feeding began, and continuing today, a few elk winter near Stanley on the high, wind-blown ridges. There, the grass peeks out of the snow and high location reduces the likelihood that cattle will found it first.Because of Gillet’s vociferous opposition to wolves, some Stanley residents have worried what might happen if wolves show up and chase the struggling band of elk that are being fed. The general area around Stanley now has two wolf packs, the long-time Galena Pack and the new Basin Butte Pack. If the elk head down into the canyon, the wolves will follow and not hang around town. 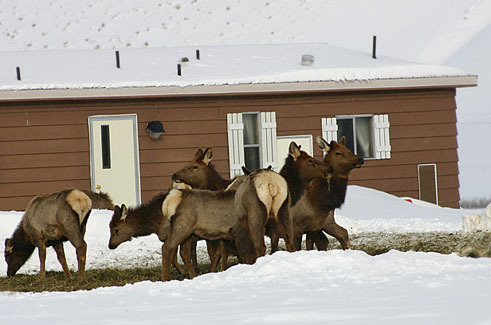 Lately the winter has been mild, with rain melting much of the previous snow, and the elk are not down in Stanley Basin. Update on Dec. 15. It turns out that Gillet may have access to an odd shape of property that is outside the Stanley city limits and may yet be able legally feed elk. On my last trip through the basin (July 04), I couldn’t help but notice the cows stomping the river’s banks. And the nearby meadows most definitely had a clipped appearance. Many suburbanites in Pennsylvania like to feed whitetails in this fashion. They and the individual feeding elk in the Stanley Basin are doing a serious disservice to the critters, taking the “wild” right out of their heads. The town council took the correct course of action.